Rubber is an export commodity which gave the country’s contribution in increasing Indonesia's foreign exchange effort. PTPN XII Banjarsari isone of the industries which process the latex material. From the whole processing stages, the sorting-part workers were the workers who complained the most about work discomfort. A sorting table with no cavities for the feet would caused workers complain about knee and calf pain. This study aimed to redesign the sorting chair and table based on the anthropometry principle. This research was expected to create table and chair sortation design that can reduce workers’ complaints in order to increase productivity and reduce human error. The data collecting method was done by 3 steps, they were interview, questioner, and direct measurement. Then, the obtained anthropometric data was made into the most appropriate sorting design of chair and the table based on the worker's posture and it was tested on the employee’s complaints, productivity and human error. The results showed that the redesign of the tables and chairs on RSS sortation caused the complaint of sorting workers in PTPN XII Banjarsari decreased. Productivity increased to 8.6%. Human error had decreased, before the redesign it was 8.1% and decreased to 1.9%. The lighting source before redesigned did not fulfill the lighting standard, therefore the redesigned lighting source used an 8 watt LED flourecent with average intensity of 685 lux. It was compatible with the lighting standard to do work that requires average intensity between 500 to 100 lux (Kuswono, 2014). SURYANINGRAT, Ida Bagus; NOVIJANTO, Noer; IRKHANA, Nadia Putri. RANCANGAN MEJA DAN KURSI SORTASI RSS (RIBBED SMOKED SHEET) YANG ERGONOMIS MENGGUNAKAN PENDEKATAN ANTHROPOMETRI (Studi Kasus PTPN XII Banjarsari). JURNAL AGROTEKNOLOGI, [S.l. ], v. 12, n. 02, p. 149-157, dec. 2018. ISSN 2502-4906. 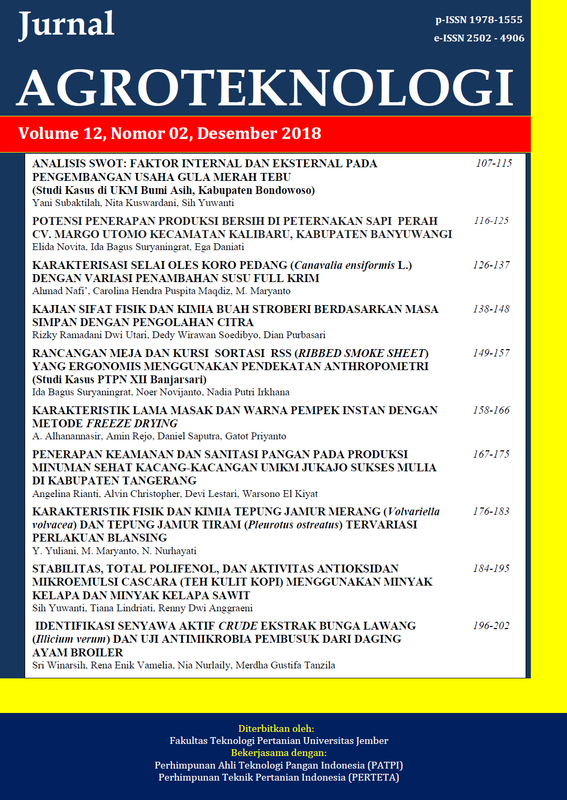 Available at: <https://jurnal.unej.ac.id/index.php/JAGT/article/view/9280>. Date accessed: 23 apr. 2019. doi: https://doi.org/10.19184/j-agt.v12i02.9280.